Choosing the best food dehydrator used to be much easier, as only a few select companies made them. Making your own DIY dehydrator isn’t overly complicated. We have built several when consumer models weren't readily available. After all, the pioneers managed to make jerky and dehydrate meat and fish using just the sun or a campfire, using a simple wooden rack. Using the sun may eventually get the job done, but for precise, bug-free, and easy dehydrating, you will probably want a self-contained unit. There are several available from modest basic units to complicated and expensive professional models. Now the only question remains is which one is best for your needs. Why Should You Have Best Food Dehydrator? Dehydrators gained popularity because consumers appreciate a way to preserve meats, vegetables, snacks, and even entire prepared meals such as chili and stews. With no loss of vitamins or minerals, these foods, adequately packaged, can be stored for years without refrigeration, and almost indefinitely in a freezer. People have found that with a dehydrator, you can pack preserved food and meals away as part of your disaster preparedness program. There also people who swear by them for reducing the bulk of meat, fruits, and snack supplies when camping or hiking. Some people in more rural areas use them to store foods and save them for a time when they may be unavailable or out of season. A dehydrator is a device that uses heated, recirculating air to remove the moisture from food, flowers, herbs, and other matter. The moisture content in some kinds of food can account for as much as 90 percent of the food’s total weight. Removing the moisture from food significantly extends its shelf life. 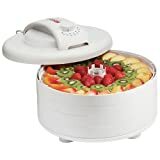 While you should not remove all the moisture from foods, a dehydrator will remove just enough to deny bacteria, mold, and fungi the moisture they need to breed and grow. Even without a timer to guide you, most recipes will tell you what to look for to assure that you will remove the correct amount of moisture. There are generally two main types of dehydrators available to consumers: stacked and shelf dehydrators. While they will both do essentially the same job, some people prefer one type over the other for various reasons. Stack-type dehydrators contain individual stackable round racks. These types of dehydrators circulate the air through the center, and it returns to the blower via the outside of each rack. As more racks are stacked, they form an air-tight seal that keeps the air circulation flowing. That causes the air to flow across each individual rack to dehydrate whatever you have put on it. 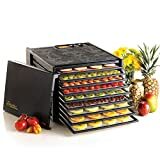 Some users have noted that they prefer the stacked dehydrator because they have a smaller footprint and can use less energy as you dehydrate less food. Fewer racks mean shorter processing time and usesing less energy. Others have noted that sometimes food closer to the blower would dehydrate a bit faster. Normally, this issue can be easily remedied with by re-arranging the racks during the process. Looking more like a microwave oven or toaster oven, Box-type dehydrators have a box shell and internal trays. Racks are placed in the box as needed, and the fan blows from the back while circulating past each tray. Some of the noted advantages to box and tray units are that they have better insulation that stacked racks. For the most part, all the trays receive an equal amount of heated air, so no re-arraigning is necessary. The most often cited disadvantage concerns the fact that they are rather bulky, even if you dehydrate a rather small amount of food. Using a food dehydrator is quite simple. Just arrange the items you wish to dehydrate on the racks. You must be sure that the pieces do not touch each other, so they dry evenly. Most dehydrators operate at roughly between 90 to 160 degrees Fahrenheit. For the most part, fruits and vegetables will take from 2 to 19 hours depending on the moisture content and toughness of the skin. Meat will take longer, depending on how thick you cut it before treating. Most jerky, for example, should be cut in uniform 1/4-inch slices for best results. Different foods will require different preparation and different times (and temperatures) in the dehydrator. Most units will tell you how long and at what temperature to process each type of food. Do not think that dehydrating your food makes it immune to spoilage. Once your product has been processed and has cooled, you will still need to store it in an air-tight container. This prevents it from absorbing moisture from the air, making it susceptible to spoilage once again. It is best to place your dehydrated products in a dark and dry place. Once you've decided to buy a dehydrator, the number of models on the market may seem confusing. With so many to choose from, it's hard to identify which features are necessary and which will prove to be superficial. With that in mind, here, in no particular order, below are our picks for the best food dehydrators of 2018. 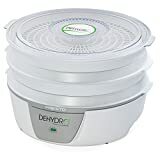 For the most part, we've chose the best dehydrators based on features available for each unit, price, reputation, and dependability. Perhaps most importantly, we considered reviews and ratings by customers. We gleaned this data from a wide variety of sources. Some units we considered were too new for a reliable customer rating, but that doesn't disqualify a quality unit. No independent list is likely to match the results of any of these resources unit by unit. They will, however, reflect the results of analyzing all the data and ratings from all of these various outlets. A box and tray dehydrator, the 3926TB has 15 square feet of drying space and boasts of 9 trays in the box, while expandable to 15 trays at 13-1/2 inches in diameter. It has a 2100 RPM, 7-inch fan for consistent air flow, as well as a 135-degree to 165-degree adjustable thermostat. Because some foods may require longer drying times, the Excalabur 3926TB comes equipped with a 26-hour thermostat timer. One feature frequently mentioned by consumers was the flexible non-stick inserts you can set between the trays to keep items from sticking. Customers also praised the Excalibur 3926TB for its easy to operate time and temperature selection switches, and its easily cleaned racks. Also noted was the full 10-year warranty. With an overall weight of 22 pounds and dimensions of 12.5 inches by 17 inches by 19 inches, this is not a portable unit. It does have an Amazon rating of 4.5 out of 5 stars and online outlet prices ranging from $$$ to $$$. A little smaller than the Excalabur 9623TB, the Snackmaster Pro is perfect for any size batches of your favorite dried goodies. Packed with five trays, but capable of handling 12, the Snackmaster Pro thermostat ranges from 95 to 160 degrees Fahrenheit. It has the classic, efficient, top-mounted Nesco heater fan for even air distribution and runs at a full 600-watts of power. Included in the box are two solid liners for making fruit leather or for drying sauces or other liquids. There are two mesh sheets for dehydrating other foods, and three packages of their delicious jerky spice and cure to get you started immediately. While a customer favorite, it must be noted that some reviews thought that having no timer was a drawback. If you are like us, you are checking it so often as the finish time approaches that you will be on time to turn it off. 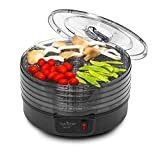 Measuring 13.75 inches by 22.13 inches by 13.8 inches and weighing in at 7.75 pounds, the Snackmaster Pro rated 4.4 out of 5 stars on Amazon. The prices online were generally between $$ and $$. If you want to take your dehydrating to the next level, the Tribest Sedona Express Digital is the unit for you. Weighing in at a full 20.4 pounds and measuring 17.5 inches by 12 inches by 14 inches, it has 11 trays made of stainless steel. It also has a glass door, an interior light, and can adjust from high to low temperature. This feature will help prevent overcooking. The temperature ranges from 77 to 167 degrees Fahrenheit, and it has multiple cooking modes. The timer can be adjusted up to 120 hours, but it is unlikely you will ever need that much time for anything. The fan, located in the back of the case, includes a dust filter. While not expandable as such, there is already plenty of room for your product without expansion. While it received high marks for its versatility and quality, this comes in as one of the priciest home units on the market. However, you can save a bit of cash by opting for the plastic trays instead of the stainless-steel ones. While too new for an accurate Amazon rating, it has a general price range online of between $$$ and $$$. This unit does come with a full 10-year warranty, so you should get your money’s worth over time. The Nesco FD-60 is easily among the most widely available and bestselling food dehydrators ever. 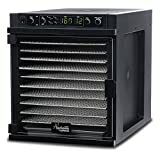 Even though it comes with only 4 trays, the Nesco Snackmaster can accommodate up to 12 individual racks because of its 500-watt, top mounted heater fan. This configuration also combats the uneven heating of some stack-type units. This heat distribution remains consistent across the entire temperature range of 95 to 155 degrees Fahrenheit. It dehydrates everything from jerky to fruits and vegetables with a constant and even heat. This unit also includes plastic liner sheets that fit in the trays for making fruit roll-ups and other more liquid-based treats. It has an adjustable thermostat, an extensive recipe book, and two packets of jerky spice and cure packets. The American-made Nesco Snackmaster measures approximately 13-1/2 inches by 13-1/2 inches by 9-4/5 inches and has a 1-year limited warranty. Online prices ranged from $$ and $$ with a 4.5 out of 5 stars rating on Amazon. 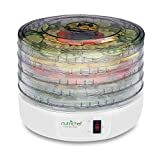 Another favorite stack-type food dehydrator, the 600-watt Presto 06300 comes with four trays and is expandable to up to eight. Weighing in at only 7.2 pounds, the Presto has trays that nest inside each other, giving it a compact size for storage or travel. The power cord stores in the base of the unit, making storage even more convenient. Some customers sited the transparent lid as an excellent feature for monitoring their product without having to open it. Also noted were the fully immersible and dishwasher safe trays and cover. One thing we didn’t like was that the temperature was not adjustable and remained a constant 165 degrees Fahrenheit. This should not prove a deal breaker, as the time can be adjusted to compensate for this. Even so, some customers saw this as a convenience drawback. The Presto 06300 measures 14.5 inches by 15 inches by 6.25 inches and has 600-watts of power. 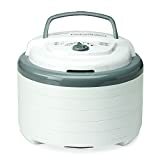 It comes in slightly behind the Nesco in customer rating on Amazon at 4.4 out of 5 stars and can be found online at prices consistently ranging from $$ to $$. Since most people don’t dehydrate things very often (at first), you may be looking for a quality unit at a modest price. The NutriChef, while not as popular as the Presto 06300, is a nice basic starter unit that will get the job done nicely. This model only has one button, like the Nesco FD-60, but comes with five trays that are easy to clean. Also, it makes everything from snacks to dried flowers quickly and efficiently. It comes in your choice of black or white and has a very respectable Amazon rating of 4.5 out of 5 stars. It also has an online price range of $$ to $$. We know this seems like an odd category, but customers were very pleased with the shelf-friendly shape of this NutriChef. Beautiful and practical, this model offers the space advantage of a box dehydrator while maintaining the benefits of a stackable unit. The airflow is exceptional, and it provides very even drying from edge to edge. Customer comments also positively mentioned the clear lid that allows for monitoring throughout the process and the mesh sheet for smaller herbs. Also mentioned was the one-touch operation and the medium range price. Because of the high rating it received from customers on several sites, we had to include it here. Measuring 11 inches by 12 inches by 11 inches and weighing just 3.1 pounds, it is relatively portable. It has an excellent Amazon rating of 4.6 out of 5 stars, and prices online consistently range from $$ to $$. Now that you have some idea of which dehydrator to choose, you can go ahead and try to prepare a few different foods. You can use inexpensive foods to get a feel for your new unit as the possibilities are many and varied. Have fun and experiment. Put a few apple slices of various thicknesses or applesauce in the fruit roll-up tray just to see how it goes. If they are not dehydrated enough, there's no harm done, as you can eat them completely raw. If you make jerky, it should feel dry and “crack” when bent but stay together without breaking. Fruits should feel leathery and not sticky or moist. Veggies should be hard and crunchy. Don’t worry that much about messing up your first batch. Most recipe books, and your manual, will guide you concerning the time and temperature that is best. Also, remember, you will learn skill and technique as you gain experience with your new appliance. However, if you test your food and discover it is not dry enough, just leave it in a little longer. Normally, you will be too eager to gobble up your freshly made snacks to leave them in for too long. Good luck, have fun, and happy dehydrating.